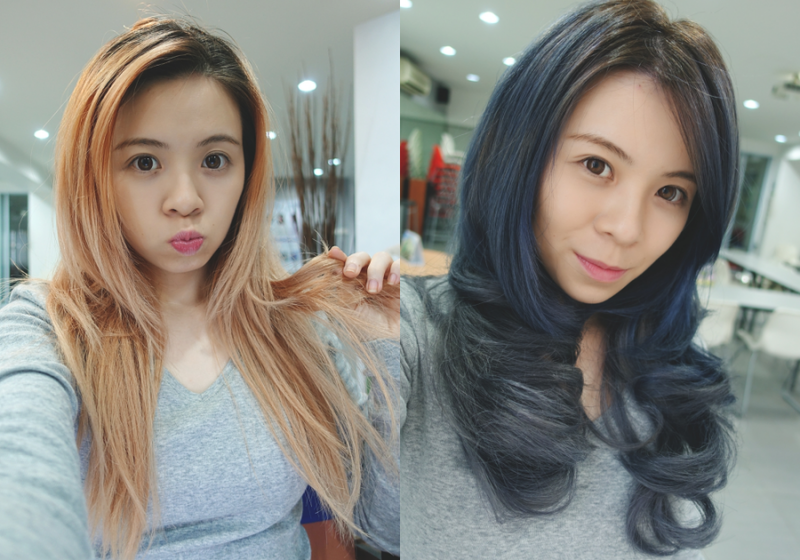 From a crazy bright red (read my previous hair post here) to a dark blue-grey for the new year, literally, what a drastic change I have to say. It was definitely a little hard for me to get used to not being somewhat blonde for a little while. In fact, I had to do a little wardrobe switch up with this blue-grey hairdo. I was invited by a Japanese hair care brand, ARIMINO for a hair session at their studio office 2 months back to try out their products. 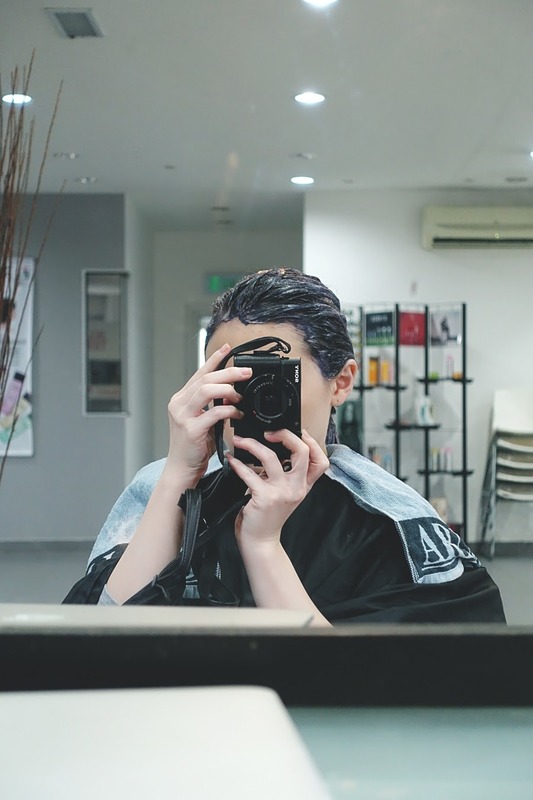 Their mission is to care for Asian Hair where you'll get to do chemical treatments without worrying of damaging too much of your hair. Of course, with proper love at home, healthier hair can definitely be achieved. There are pictures of my hair now at the end of this post. This was definitely one of the quickest hair colour I've ever done! I only sat for 2-3 hours and I was done for the day. The reason for this is because they used a different colouring technique as compared to my usual salon colour do. Instead of separating the hair into many smaller sections for the brushing of the colour cream onto the hair pieces, the stylist just squeeze out the mixed colour cream from a bottle and massage it on my hair as a whole and only section in huge chunks of hair as needed. Then he added the blue onto the middle sections of my hair with the same technique. I loved the colour as it's the in-trend dolly matte/pastel look. The grey looks perfect but the blue turned out a little patchy. I believe it's because of the technique, probably needs more time and attention spreading the blue colour cream out properly so it will look more even. He said is the style that wanted to achieve =_= ...... Whatever. On a lighter note, I can't deny that he did a great job at curling my hair and throughout the process, he was really gentle when handling my head and scalp. I'll give him a thumbs up for that. Frankly, managing a matte/pastel hair colour is not the easiest thing to do. For starters, it looks dry without even trying and that's how it supposed to look... matte! So the best way to make it look lively is to use oil and keep it neat and done so it looks like effort have been put into it. Well, that's fully not what I did. I couldn't care less about styling it, I just paid a whole lot of attention into nurturing it, to keep it as healthy as possible. The grey lasted for some time but the blue faded out about within 2 weeks. This is the new packaging that comes with a pump in an 80ml light, plastic bottle. In Malaysia, you can only get them at certain hair salon that carries ARIMINO services and products. I'm not quite sure about the pricing but I believe different salons might sell them at different price, so I highly suggest you call them and enquire about it first. *A video is coming up with me using this product. Stay tuned! Your hair looks really pretty and beautiful! Keep up the good job in taking care of them! !